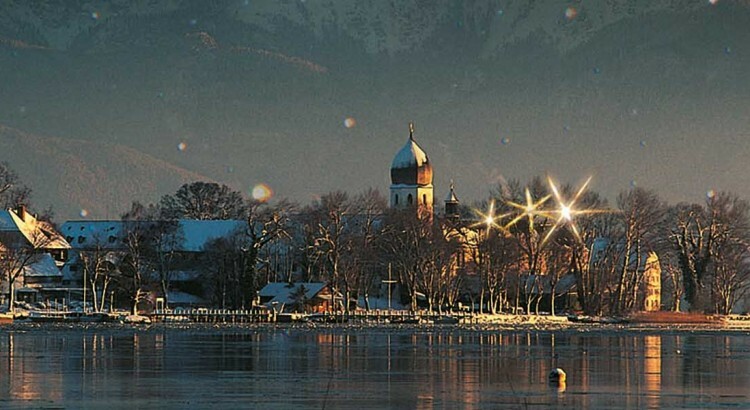 The only island Christmas market in Germany is situated in a truly unique and romantic setting – in the heart of the Bavarian Alps and surrounded by the crystal clear waters of Lake Chiemsee. The island is a beautiful place to visit throughout the year, with its still operating Cloister and rich community of artists, crafts-people and fishermen. Opposite to “Frauenchiemsee” is the island of “Herrenchiemsee” which is famous for its palace “Castle Herrenchiemsee” built for “crazy” King Ludwig II and based upon “Versailles”. The whole island is lit-up with elaborate Christmas decorations and lights, creating a really special and traditional atmosphere. Sweet smelling aromas fill the air as over 90 stalls sell culinary delicacies, wonderful arts & crafts, woodcarvings, mulled-wine and many other great gift ideas. 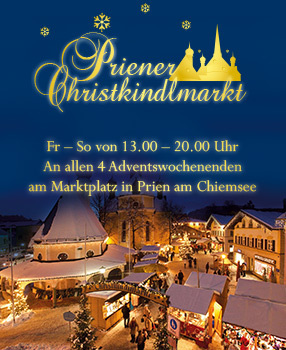 Also visit the Christmasmarket in Prien at the marketplace on the 4 weekends in advent. Reaching the Island of Frauenchiemsee is easy with regular boat-trips from Prien am Chiemsee. Prien at Lake Chiemsee is the ideal holiday base. Situated in between Munich (1 Hour) and Salzburg (45 Mins), Prien is well serviced with excellent rail and road links and lies within easy reach of a whole variety of tourist attractions: Innsbruck, Swarovski Crystal World and Königssee to name just a few. „Marktl“, the birth town of Pope Benedict and Neuschwanstein – the Fairytale Castle of King Ludwig II are also easily accessible. You have the possibility with just one ticket to travel from the train station in Prien to Prien/Stock (harbour) and then direct with the ferry to the Christmas Market. The departure times are all coordinated with the arrival of the regional trains in Prien. If you are travelling by car, there are plenty of carparks located near to the train station or directly at the harbour of Prien/Stock. Please ensure that you use the newly built and comfortable coach parking spaces at Prien/Stock (Harbour) as there are only a very limited number of coach spaces in Gstadt. For group arrangements and accomodation, please contact the Prien Marketing GmbH. Gerne unterbreiten wir Ihnen individuelle oder Gruppenangebote.